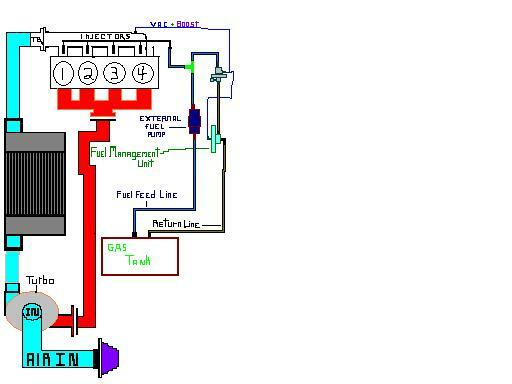 Fuel System Diagram / With Return line!! 5) About 6-Ft of Rubber EFI Fuel Hose and Clamps( full circle nut and bolt type clamps are preferred to avoid clamp failure!! If you choose to and you use a steel fuel return line you can simply weld or braze the fuel line to the filler neck,it is best if you insert the fuel return line into the filler neck atleast 5 or 7 inches inside it and facing twards the tank inlet or DOWN so the fuel is directed into the tank and not where the filler neck filler inlet is located. And again Please feel free to contact us reguarding anything about the fuel system upgrade or any other questions or comments you may have, we are always happy to be able to help out and to hear any suggestions about what you like or wnt to see added to the site. BE SAFE AND CAUTIOUS !!!!!!!!! !